I have worked on a few iOS games lately and realized how useful it would be to simulate the iPhone 4S and iPad 2 speakers. It can be a real pain in the neck to transfer sounds to your iOS device when testing or waiting for a new build to see how your sounds will work on each devices speakers. 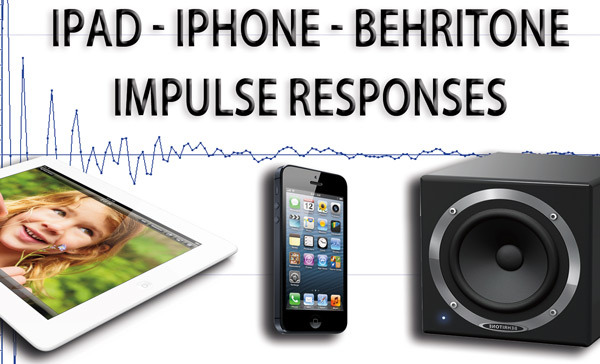 Well, I decided to sample the impulse response from each device to do just that! These impulse responses will work in most convolution reverbs as long as they can import .wav files. Make sure you change it to mono to really simulate what will happen! I’m using Izotope Trash 2 to do this on my computer, but you can use any software that allows importing impulse responses and summing stereo to mono signals. So, what can you use these for? I’m glad you asked! Any sound designer or developer working on game audio can use this on a master audio bus in their DAW to simulate how an iPhone or iPad will alter their sounds. Anyone making music for portable devices like smartphones can do the same and get an idea of what frequencies will jump out on these small speakers! If you work in post you could use them to simulate a conversation on a smartphone or music through one of these devices. By the way, if you want to make your own impulse responses for your convolution reverbs using a free tool check out one of my other posts for a clear tutorial. Please let me know if you found these impulse responses useful and I will make some more 🙂 If you want some other impulse response I’d love to hear about it in the comments below! All product names used in this webpage and download are trademarks of their respective owners, which are in no way associated or affiliated with Aaron Brown. These trademarks of other manufacturers are used solely to identify the products of those manufacturers whose tones and sounds were sampled during impulse response capture.